Hi there and "servus" from overheated Vienna! 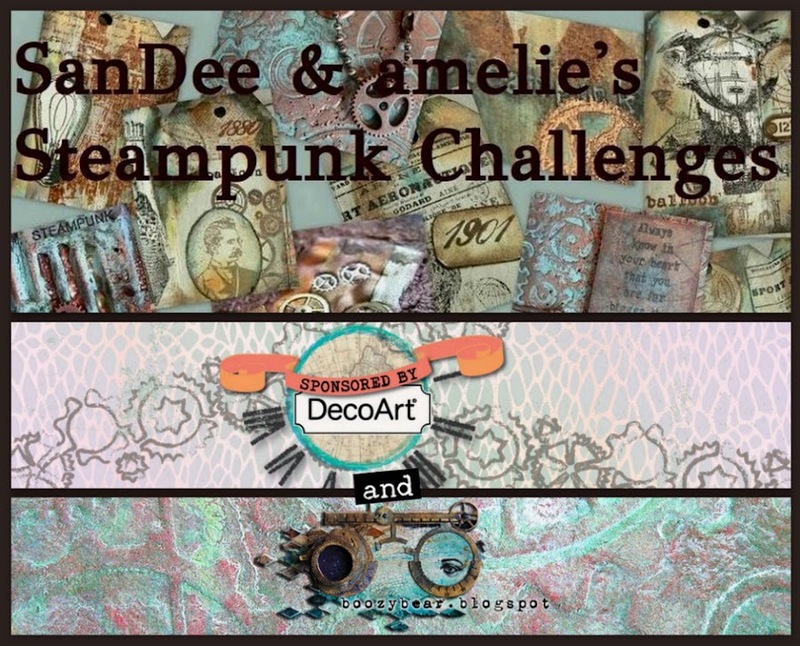 Die amelie here to bring you another spotlight on one of this month's fantastic projects that have already been entered with our challenge. There's still one more week left to enter a project and become eligible for the wonderful prize sponsored by Daniela Rogall! 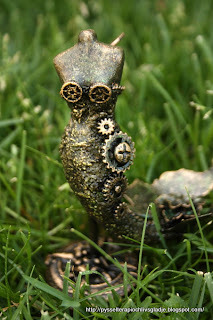 Servus and hello, dear Steampunk friends and crafters! 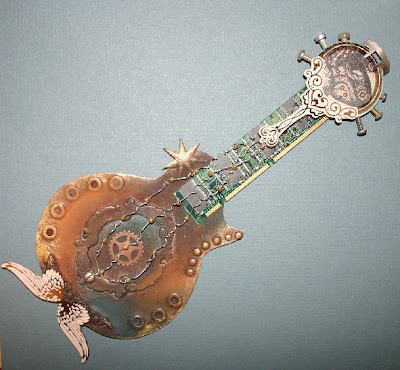 I welcome you back to our tiny Steampunk space to show you our first spotlight of this month and to tell you about the prize we will give away to this month's randomly drawn winner. So all who enter our challenge with a project that follows the theme and the rules are eligible for this awesome gift from this month's sponsor, Daniela Rogall, owner of creavil store. 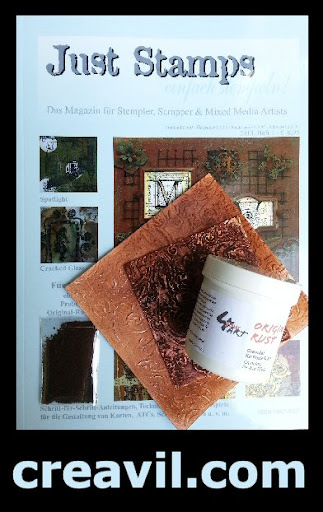 Daniela is giving away a jar of "Real Rust" and a copy of her awesome stamp magazine "Just Stamps" - awesome, isn't it? Thank you so much, Daniela, for being our sponsor this month! And now to our July spotlight. 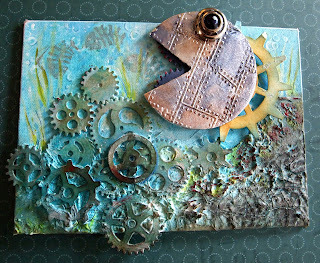 I LOVE how Jenny aka Buttons used the various metals with her project and the corrugated card gear is so brilliant! 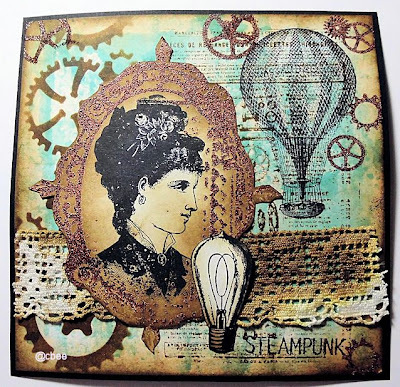 For those who know how hard it is to master the very small format of an ATC it will be obvious how great she managed to create the impression of a large canvas... a stunning effect and loads of awesome texture! 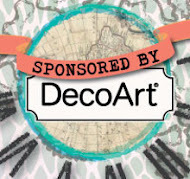 Thank you, Jenny, for entering our challenge with your wonderful art! Please, feel free to grab the spotlight badge and display it with your blog. And you, dear readers and players, be reminded: there are still (or only? I don't know ;) two more weeks left to enter our Rust challenge and thus get eligible for Daniela Rogall's great prize! 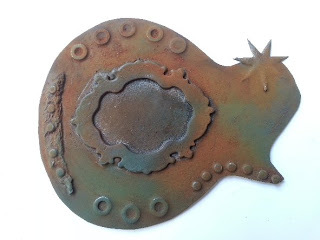 Finally access to blogger has been reinstalled and Sandra can join in again, so we did our voting of the Top3 for the 2D and 3D sections of our Underwater Challenge! We are so proud and happy that you all share these loads of awesome projects with us!!! Thank you all so much! Our current challenge "Rust" is still open until the end of the month and we are looking forward to see many awesome entries again. Hello and welcome back, dear Steampunk lovers friends and followers! 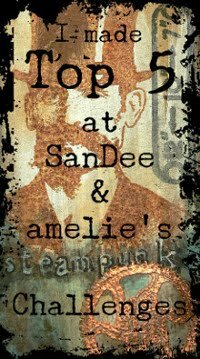 As Sandra is not only dealing with a nasty flu but also has some strange problems with blogger not letting her use the post forms, our communication has slowed down a little...so, please, give us some more time to finish the votes for our Top3 for June! 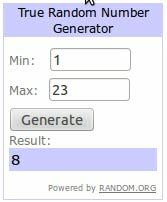 We will announce them as soon as possible - promise!